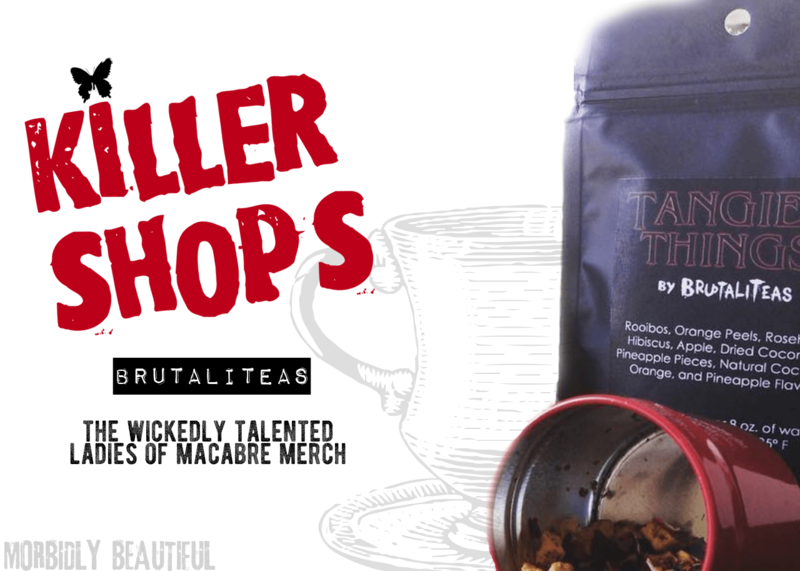 BrutaliTeas is shop that makes unique and quality loose leaf tea blends with names that parody horror movies, metal, rock, and alternative bands. It’s run by the lovely Courtney and her husband Adam. 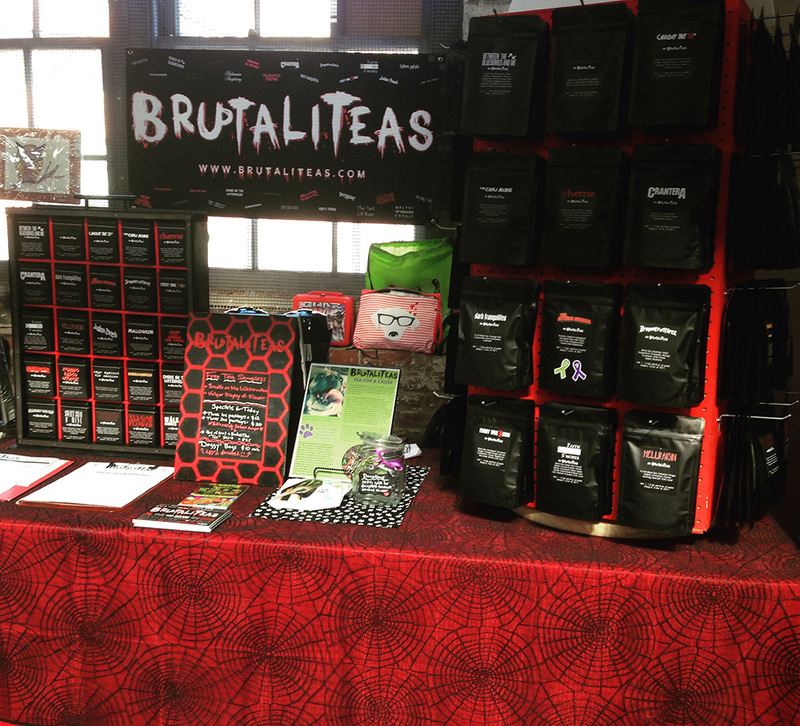 We love BrutaliTeas for their great packaging design, their passion and creativity, and their killer selection of delicious tasting blends (seriously, it’s almost impossible to pick from their many incredible flavors…and also impossible to go wrong with whatever you pick). For years, I worked with loose-leaf tea in a retail setting. I fell in love with tea and coming up with my own blends — as well as introducing tea to others and seeing their excitement for the product. I absolutely disliked the retail world and ended up leaving my retail job to start another job. A couple of years went by, and I really missed working with tea. So I decided I would just start my own business (like it’s really that simple!). Before BrutaliTeas was created by myself and my other half, Adam, I started a small Etsy shop for loose leaf tea blends called The Bee’s Teas. 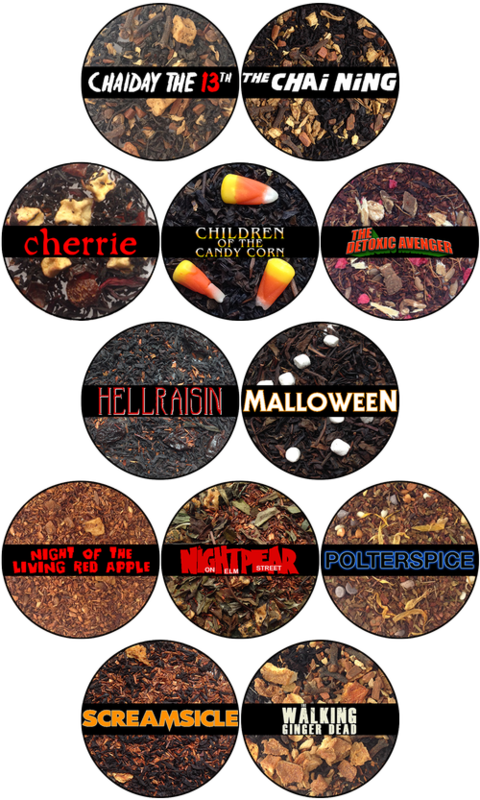 Years later, a friend was joking around with us and told us we should start a line of teas with brutal names. We brushed it off at first because it seemed so silly. But then one day we were like, “Why not?” So Adam starting coming up with names, and I started coming up with blends. Six months later we launched our website with 25 flavors, and we now have about 60! It blows our mind how supportive and excited people are for our teas, and we appreciate that more than our customers will ever know! I didn’t start to appreciate horror until I was a young adult. I remember watching horror movies as a kid in the 80s and hating them. For some reason, the only movie I could watch over and over (without peeking through my fingers) as a youngster was The Toxic Avenger! Years later, I started re-watching a lot of 70s & 80s horror through adult eyes…and fell in love! Not sure what it is about horror movies, but they speak to me in some way — especially the ones that seem a little too realistic. Those are the very best!! 3. Where does inspiration for your products come from? What is your creative process like? 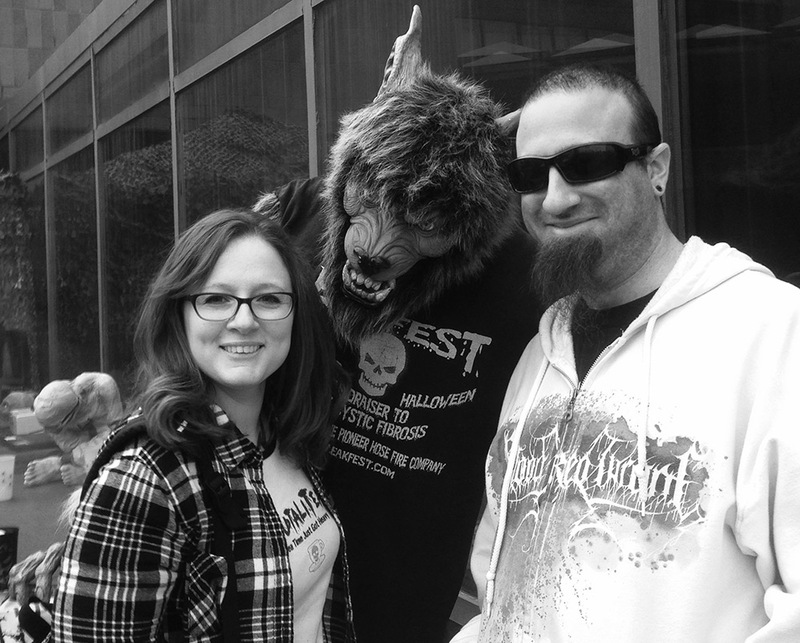 We both have been huge fans of music all of our lives, particularly metal, rock, and alternative. We both spent a number of years street teaming for bands in different states, and Adam has been doing live band photography for many years. It only made sense to get our inspiration from those we admire most! I’m the horror fan in the house, so it was my idea to tap into that as an inspiration as well! The best part is seeing an idea you have come to fruition…and others appreciating it. There’s really no other feeling like it. It really gives you a sense of accomplishment. 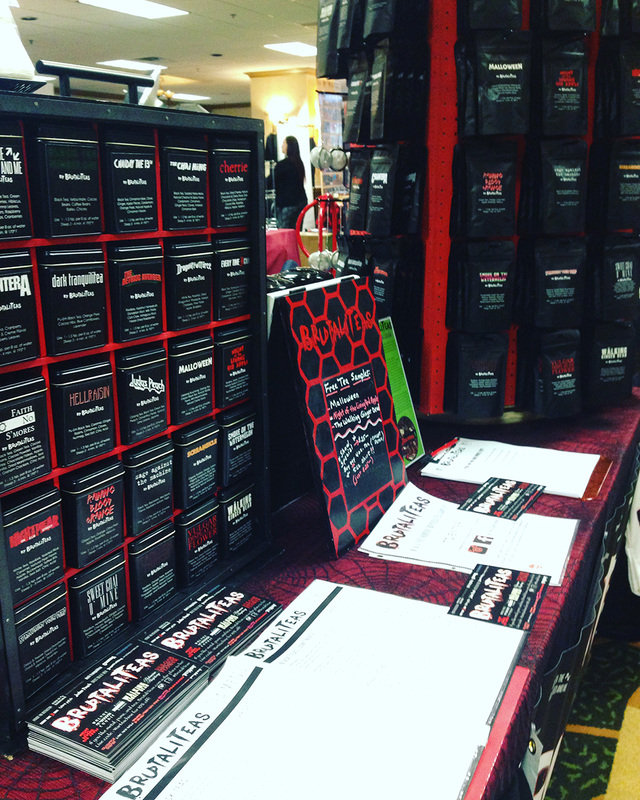 We love going to vending events and meeting so many awesome new people and seeing them laugh and get a kick out of our products. It’s a good feeling to give someone a little smile in their day. The hardest part is that YOU are solely responsible for your business’s success or failure. Everything relies completely on your efforts. Owning a business is not always as glamorous as people may think. There are a lot of countless hours, blood, sweat, and tears that go into keeping it going. It’s definitely not for the weak at heart! While it can be a heavy weight on your shoulders, the advantages definitely outweigh the disadvantages. I think it’s important for people to support all small business — whether it’s female-owned, male-owned, or co-owned. When you support small business, you are truly supporting someone’s dream and playing a part in his or her success. Your support is truly a gift in the eyes of a small business owner, and you will always be appreciated by the small businesses that you support. 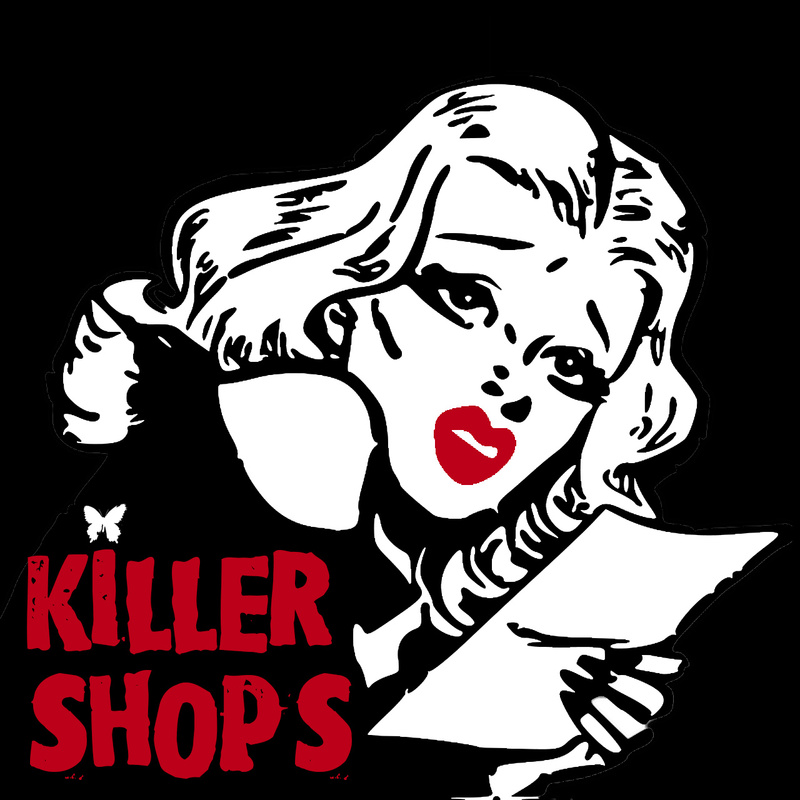 We are most active on Facebook and Instagram @brutaliteas. We love interacting with our customers, just as we would our friends! Our products can be found at www.brutaliteas.com. Thanks for posting this I didn’t know about them and can’t wait to try their teas!